Herbal teas have long been known for their health benefits, and one of the best newcomers to the scene is a tea you probably haven’t heard about yet. It’s called Rooibos (ROY-boss) tea. And even if you know nothing about it right now, I know you’re going to love it. And despite it being relatively unknown to tea drinkers worldwide, it’s steadily gaining popularity. Let’s find out. Here are the health benefits of Rooibos tea. Rooibos tea is a fragrant red herbal tea with a naturally sweet taste reminiscent of honey and roses. 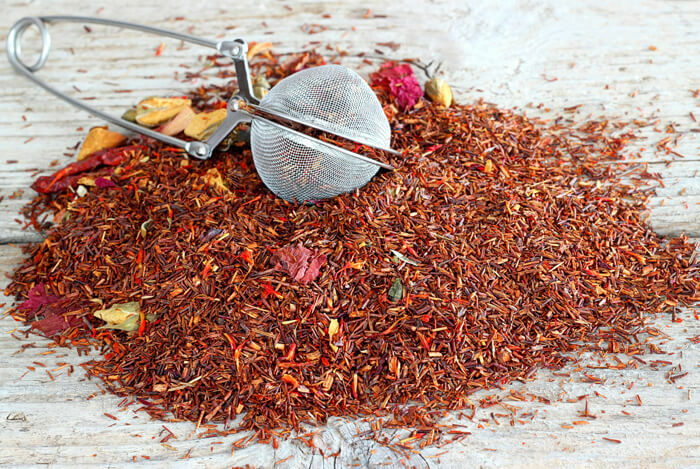 The plant it’s derived from, called Rooibos, is also known as the Red Bush. The Red Bush is found in only one place in the world: the Cederberg Mountains of South Africa, and grows about 3 feet tall with pine tree-like needles for leaves. 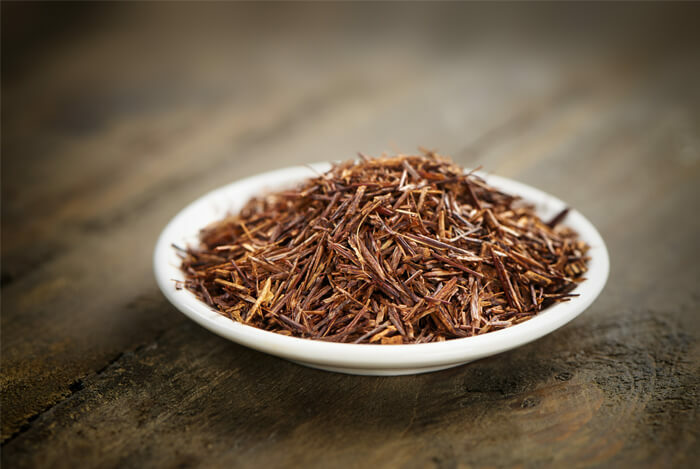 The majority of commercially available Rooibos tea is naturally fermented and dried to reach its deep red color, even though the leaves of the Rooibos bush itself are green when harvested. The tea is now very common in countries like Japan, Germany, and England – but Jerry Hemelka of Port Trading Co., one of the major importers of Rooibos, says it will soon dominate the United States’ tea market. Compared to other teas, Rooibos is considered a great source of minerals like calcium, potassium, iron, copper, zinc, and magnesium. Rooibos is rich in the super-antioxidant flavonoid compound quercetin. Quercetin is known for its long list of health benefits that we’ll touch on later. The fresh leaf of Rooibos has a high content of ascorbic acid, or vitamin C – another powerful antioxidant. If you drink Rooibos tea as you age, you can keep your bones strong and healthy throughout the years. The minerals in Rooibos are what make it especially bone-healthy: magnesium, calcium, manganese, and zinc. Calcium is essential to the strength of the bones and to help maintain proper bone density. Manganese stimulates the production of healthy enzymes that help to optimize bone construction and repair. Higher magnesium intake is associated with a higher bone density in both men and women. Zinc has a stimulatory effect on bone formation and mineralization. Even though research into Rooibos tea is still in its earliest stages, it’s known to be safe to consume and naturally delicious. Oh, and one more thing: it’s calorie free! Right now, you may have to do a little work to track down your nearest supplier of Rooibos tea. The majority of grocery stores aren’t carrying it yet. Odds are, you can probably find it in a specialty tea house or coffee shop. What’s your take on Rooibos tea? Have anything else you’d like to share? Let me know in the comments below!